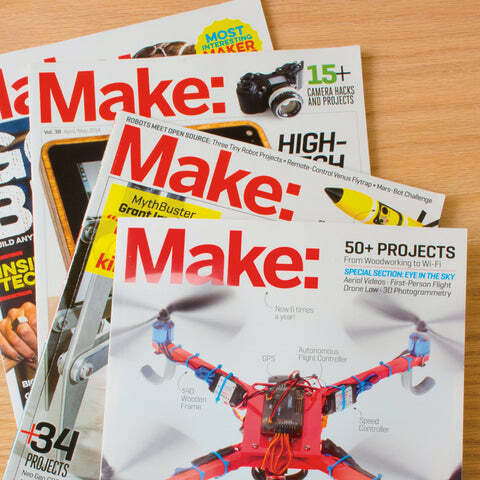 Community Editor for Make: I get ridiculously excited seeing people make things. I just want to revel in the creativity of the masses! My favorite thing in the world is sharing the hard work of a Maker. Introduce electronics into your craft projects with the Flora sewable electronics platform. The small form factor and sewable pads make this easy to integrate into most textiles and the abundance of tutorials available will keep you busy for the foreseeable future. New to sewing? Hone your skills on this adorable owl kit. All of the parts you need are included in the box, as well as easy to follow instructions. Use this cute hooter as a springboard into your stuffed animal-making hobby. Not all scissors are created equal. While it’s often recommended to get a different pair of scissors for each material you’re going to be cutting regularly, that’s not always feasible. If you’re going to get just one pair, get some titanium bonded nonstick scissors. They’ll stay sharp and clean. With unmatched versatility, Dremel is the quintessential Maker’s tool. The Moto-Saw attachment brings even more possibilities to your desktop, whether you’re cutting shapes from wood, fiberboard, or even thin metal. Your work surface can make a project easy or difficult. A self-healing cutting mat is fantastic to work on, even when you’re not cutting. Built-in grid lines and a nice feel keep you focused on your project, and the surface won’t dull your knives the way others can.